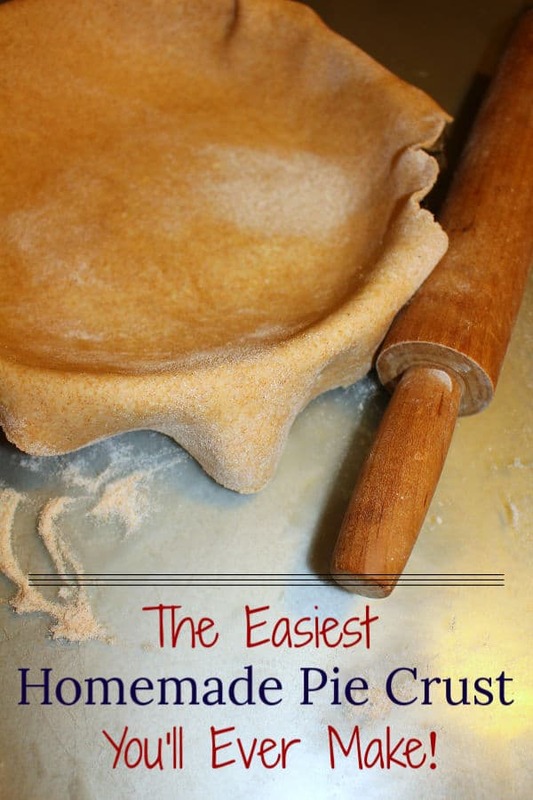 We all need a simple homemade pie crust recipe in our recipe box, don’t we? I don’t know why, but people seem intimidated by the thought of making a pie crust from scratch. It’s one of the most basic things a home cook can make, yet few of us do it ourselves. My pie crust has only four simple ingredients and one important rule – keep the ingredients cold. That’s the key to a flaky crust. You can make this pie crust recipe with the wheat flour of your choice, of course. I haven’t tried this recipe with any other flours, such as coconut flour or almond flour . I suspect you could use 1-to-1 Gluten Free Flour and get a pretty good result, but I’ve not tried it yet. If you try other flours, please tag me on social media and let me know how it turned out. My children say it tastes like delicious buttermilk biscuits when it’s made for a savory dish. I think you’ll agree, whether you make it sweet or savory, that it’s simple and superb! I love this recipe for making homemade pot pies, tortes, and even the occasional berry or fruit pie. Here’s the recipe. See below for a printable version. 1. Cut cold butter into cubes and return to the fridge while preparing the other ingredients. 2. Put the flour and salt (and sugar, if making a sweet pie) into a food processor. 3. Put the ice water into a small bowl. 4. Add the butter to the food processor and pulse until the mixture looks like wet sand. 5. Begin to add the ice water 1-2 Tbs at a time, pulsing after each addition. 6. When the dough begins to come together in one lump, it is done. 7. Divide the dough in half. 8. Form into a ball with as little handling as possible. 9. Wrap each ball separately in plastic wrap. 10. Flatten each dough ball into a thick disk. 11. Refrigerate for at least 45 minutes. 12. When the pie filling is ready, remove the crust from the refrigerator and roll out as usual. Bake according to the directions on the pie recipe you’re making. For a sweet pie add 3 Tbs of sugar I use coconut sugar or maple sugar. Cut cold butter into cubes and return to the fridge while preparing the other ingredients. Put the flour and salt (and sugar, if making a sweet pie) into a food processor. Put the ice water into a small bowl. Add the butter to the food processor and pulse until the mixture looks like wet sand. Begin to add the ice water 1-2 Tbs at a time, pulsing after each addition. When the dough begins to come together in one lump, it is done. Form into a ball with as little handling as possible. Wrap each ball separately in plastic wrap. Flatten each dough ball into a thick disk. Refrigerate for for at least 45 minutes. When the pie filling is ready, remove the crust from the refrigerator and roll out as usual.